Hoopsters are large, ladybug-like insects first encountered in Super Mario Bros. 2 as infrequent enemies. 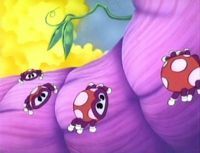 In Super Mario Bros. 2, Hoopsters can be found crawling up and down vines, speeding up if the player is near/on their vines and hurting the player if they touch them from the side or below. By jumping on top of a Hoopster though, the player can ride them up the vine the creature is crawling on. In NES and SNES version, Hoopsters are red with black dots, but in the Game Boy Advance version, they are yellow with brown dots. In the Super Mario All-Stars and GBA versions of Super Mario Bros. 3, the king of Desert Hill is turned into a Hoopster with his own magic wand by Morton Koopa Jr.
Additionally, Super Mario Advance 4: Super Mario Bros. 3 features them as enemies in Rich with Ropes, acting as they did in their debut. The sprites for them were reused from the main game. Four Hoopsters from The Super Mario Bros. Super Show! Several Hoopsters appear as minions of King Koopa in The Super Mario Bros. Super Show! episode "Mario and the Beanstalk", being sent by King Koopa to attack Mario, Luigi, Princess Toadstool, Toad and their goose ally on a giant beanstalk. These Hoopsters are defeated by Mario, who throws several Garbanzo Beans at them. When Mario first arrives in the Mushroom Kingdom in Double Trouble, he spots some Hoopsters (most of them presumably sand clones created by the GLOM) fighting for room on a hill. Later, Mario casually mentions that he hates it when the beetles ruin his picnics by stealing the food. In Leaping Lizards, Hoopsters are used in the second International Mushroom Games event, the Beetlebowl, in which the goal is to catch and dunk Hoopsters into an opposing team's bucket. The gold trophy awarded to the winner of the tournament is also described as being based on a Hoopster. In Pipe Down!, Ludwig von Koopa can use his giant pipe organ to summon some Hoopsters and other enemies to swarm the Mario Bros. if they attempt to attack him directly during one portion of the book. In Dinosaur Dilemma, while traveling through a forest, Yoshi spots some Hoopsters crawling around a tree trunk, and eyes them hungrily. Tāpen Turpen, short for Turpentine. On the cast list at the end of Super Mario Bros. 2, Hoopster was misspelled as Hoopstar. This is corrected in Western versions of Super Mario Advance. This misspelling in earlier versions of the game is likely due to a translation error. In the Japanese manual, Hoopster is likened to a soccer ball, whereas in the English one, it is compared to a basketball (likely referring to the "hoop" in its name). ↑ 1.0 1.1 「サッカーボール大のテントウ虫みたい怪物。つるに住みつき上下に移動している。」 ("A soccer ball-sized, ladybug-like creature. It lives on vines and crawls up and down.") - Yume Kōjō: Doki Doki Panic instruction booklet, page 32. ↑ "He is a creature about the size of a basketball. He resembles a ladybug. He lives on vines and crawls up and down." - Super Mario Bros. 2 instruction booklet, page 24 (Hoopster description). This page was last edited on February 9, 2019, at 11:10.